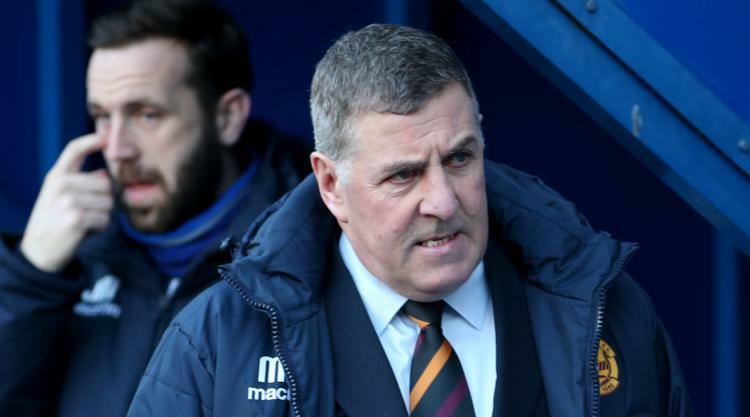 Motherwell manager Mark McGhee accepted he was under pressure following a 5-1 home defeat to Dundee - but he called for "realism" in the face of a defensive injury crisis. Ten days after conceding seven goals at Aberdeen, Motherwell shipped five in the first half at Fir Park against a rampant Dundee side who consolidated sixth place in the Ladbrokes Premiership, moving six points above their opponents. Third-bottom Motherwell were missing injured full-backs Richard Tait and Steven Hammell - both of whom could be back for next Saturday's trip to Kilmarnock - and central defender Stephen McManus, who is out for a further six weeks with a groin injury. A back four with an average age of 21 - Jack McMillan, Joe Chalmers, Zak Jules and Ben Heneghan - struggled in their absence as Dundee swarmed forward in numbers. Goalkeeper Craig Samson was also culpable as Marcus Haber, twice, Craig Wighton and Mark O'Hara added to Jules' early headed own goal. A small group of young fans had had enough by half-time and left to protest outside the main entrance to Fir Park. By the time an uneventful second half had finished, they had acquired a 'Get McGhee Out Now' banner and were joined by a few dozen more supporters. But McGhee insisted the protest would not change his feelings about his job. "Not at all," the Scotland assistant boss said. "I understand what everyone is saying, don't get me wrong, they are quite entitled to it. "I'm not arrogant enough to think that I'm immortal and 7-2 away to Aberdeen and 5-1 at home doesn't put me under pressure. Of course it does, but it doesn't change my desire to do the job. "Yes, we are hugely disappointed, I understand fans' frustrations, but they also have to be realistic. We had a very improvised back four which couldn't cope with Dundee. "But the second half we showed, it's not about spirit, it's not about togetherness or psychological issues, it's simply that on the day in that first half we weren't strong enough or physical enough to cope with Dundee. "It was an organisational thing, it was people in situations not doing well enough one to one. When the ball was coming into the box, we weren't winning headers. Nobody was heading the ball and they were putting decent balls in." Motherwell, who were briefly level following Louis Moult's 22nd-minute goal, have now lost six out of seven games in 2017 but the latest defeat was the most damaging to their league ambitions given all of the others had come against the top four sides. However, McGhee felt there were mitigating circumstances. "We put out the back four that we had in the absence of Tait, McManus and Hammell," the 59-year-old said. "Clearly, they didn't cope with it. "Physically, the lad Haber, particularly, bullied them. They didn't stand up to the physical challenge that he presented. Every time the ball went in our box they looked like they were going to score and most of the time it went in our box they did score. "That was hugely disappointing, we hoped for a little bit better than that. It was a slightly improvised back four but today brought home just how much we missed the experienced defenders." There was little action in the second half and Dundee manager Paul Hartley revealed he had ordered his side to be more cautious after a first-half display bristling with ambition. Hartley, whose side followed up victory over Rangers, said: "The first half was an excellent showing, we carried on from last week the tempo, the intensity and goals that we scored, and just an overall performance and shape. "We knew it was going to be a different second half and we said to the players: 'don't concede any goals' and they managed the game properly. "A lot of people will talk about Motherwell's first-half performance but you have got to give our players credit. We were on the front foot, we came and had a go straight away, which we did last week."